Reverberant noise from the R Lounge's smoking patio was a problem for the LA club's new neighbors. 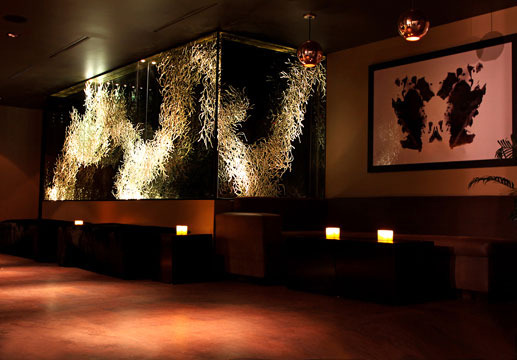 R Lounge managers installed QuietFiber sound absorbing material on the club's urban chic concrete walls by hiding it in plain sight - wrapped in custom fabrics to fit in with the club's upscale decor, and hung like art. 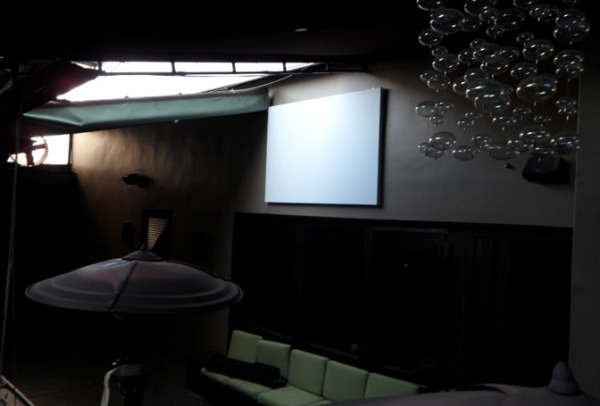 Photos 1, 2 & 3: The custom covered QuietFiber panels fill the R Lounge’s massive concrete patio walls. No one can tell they're functional art. Photo 4: A striking view of the R Lounge's post-modern interior design, carried out successfully into the outdoor patio's added QuietFiber-based noise deadening elements. LOS ANGELES, California, November 15, 2011 – QuietFiber® noise absorbing material was installed last week in the tony R Lounge in L.A. to address a reverberant noise issue caused when pulsating music from inside the club hit the massive, 14-foot tall hard surface walls and flooring of the outdoor smoking patio every time a guest opened the patio doors to step outside. When complaints from neighbors began to trickle in, club owner Bobbie Rahmani moved immediately to find a noise deadening solution that would not only provide relief to his neighbors, but would not detract from the club’s high end décor that flowed from inside out. The large, reverse “L” shaped smoking deck needed soundproofing material that would retain its acoustical integrity in the outdoor environment, and just as importantly, be easily camouflaged within the well-appointed patio. Rahmani’s research led him to Acoustiblok, Inc., where acoustics consultant Paul Getts recommended QuietFiber, a noise absorbing material specifically designed to address reverberant sound. Unlike other sound absorbing products, QuietFiber is designed to be hidden out of sight, or easily adapted to any décor by simply wrapping it in complimentary fabric or upholstery, which is the approach Rahmani chose for his club. Rahmani purchased 10, 4- by 6-foot panels of QuietFiber, enough to cover all the patio walls’ trouble spots. 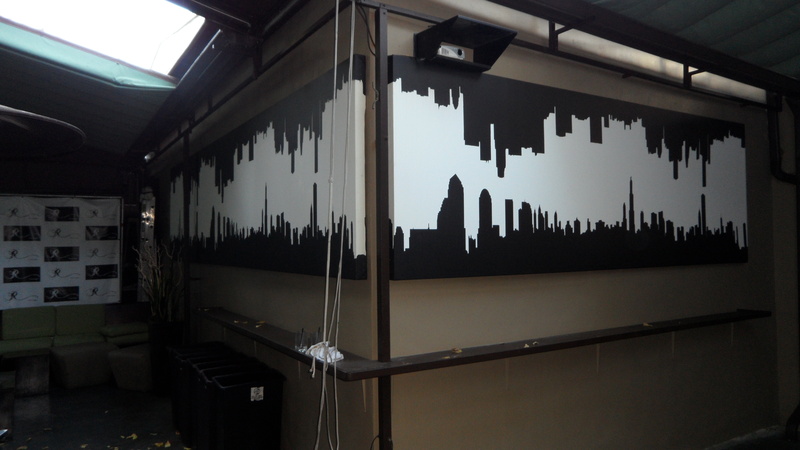 Eight panels were covered in a sleek, black and white post-modern skyline design fabric that added interest to the space without giving away the panel’s soundproofing purpose. Another panel was ingeniously covered in a blank white canvas and hung on a large section of wall, providing a backdrop for projected images to create a constantly moving and changing videoscape in the space. This panel provides a fitting artistic element, and no one is the wiser that it is serving a dual purpose – sound absorption and aesthetic interest. One more panel, hung on a wall directly behind the patio’s elegant outdoor cigar bar, is concealed in fabric identical to the wall treatment, making it virtually undetectable. “We haven’t had any complaints since we hung the panels, and no news is always good news,” Rahmani said of the noise deadening qualities of the Quiet Fiber treatments. “I did a lot of research to find the right soundproofing product for the space, and found that other panels that address reverberant sound are extremely expensive and don’t provide the customizable look we needed for this space. Lahnie Johnson, president and founder of Acoustiblok, Inc., said that the application of QuietFiber in the R Lounge is a perfect example of the product’s unique versatility when it comes to addressing reverberant sound without interfering with the design aesthetic of the space. “We launched our QuietFiber material with this type of environment in mind,” Johnson said. “When you’re addressing solid surface noise issues in well-appointed residences or businesses like the R Lounge, you can’t hang ordinary sound abatement products because, although they serve a functional purpose, they aren’t necessarily going to look good in the space. High sound absorbency QuietFiber is a two-inch thick DIY interior noise solution that can be cut to fit and simply hot glued underneath a bar, cabinets, countertops, tables, chairs, behind a wall tapestry or curtains. Slide a QuietFiber “pillow” on top of cabinets, or anywhere else that reverberant noise and echo is a problem. Easily cut to size with a serrated knife, Quiet Fiber can be concealed almost anywhere. QuietFiber®, is the answer to any space in need of a quick noise fix that is easy to install anywhere noise is a problem, without spending thousands of dollars to retrofit sound abatement material under drywall, or cover walls with expensive sound panels. For more information on QuietFiber, visit the Acoustiblok website (www.acoustiblok.com), send an E-mail (sales@acoustiblok.com), or call 813.980.1400. 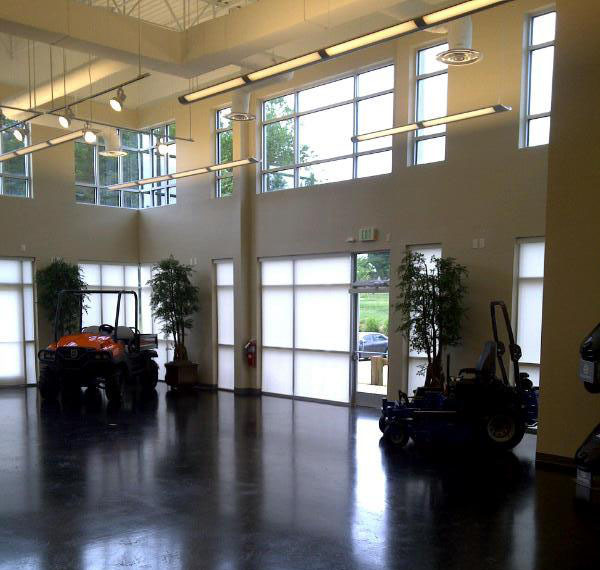 CHARLOTTE, North Carolina, October 31, 2011 – Acoustiblok® noise deadening indoor sound panels have been installed in the 4,770 square foot showroom of Husqvarna Group’s North American corporate headquarters in Charlotte, North Carolina. Husqvarna Group, the world's largest maker of outdoor power tools, opened the massive research and development complex which includes the dealer showroom, in July 2011. But the showroom’s hard surfaces and high, open ceiling created problems with reverberant noise and echo within the structure that made communication difficult. Husqvarna North American Test Manager Bob Samuelson said they realized early on that they needed to address the noise issue, and began a search for an appropriate noise deadening material. Jay Boland, an acoustical consultant for Acoustiblok, Inc., recommended sound absorbing panels for the large space. 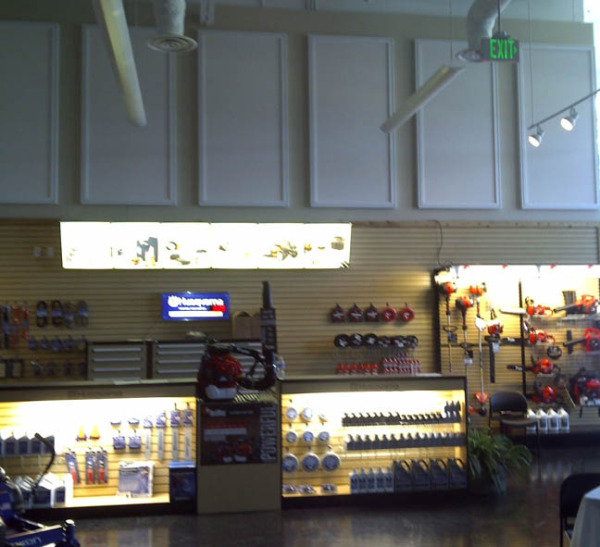 Forty-five, 4- by 8-foot and 10, 4- by 6-foot fire resistant glass cloth indoor sound panels were installed on walls throughout the showroom space to provide the highest sound absorption per square foot of any indoor sound panel product available. Acoustiblok’s Indoor Sound Panels, part of the Acoustiblok QuietCloud® product family, are affordable and easily installed. “We requested a quote from another soundproofing material manufacturer, and it was way too high,” Samuelson said. “We did some research and found Acoustiblok. Lahnie Johnson, president and founder of Acoustiblok, Inc., says that reverberant sound is a common problem in structures like the Husqvarna showroom, which has an abundance of hard surfaces and high ceilings. Sweden-based Husqvarna has been in business since 1689, originally established as a rifle maker for the Swedish Army. Today, the brand and worldwide subsidiaries range from lawn sprinklers to robotic demolition equipment. 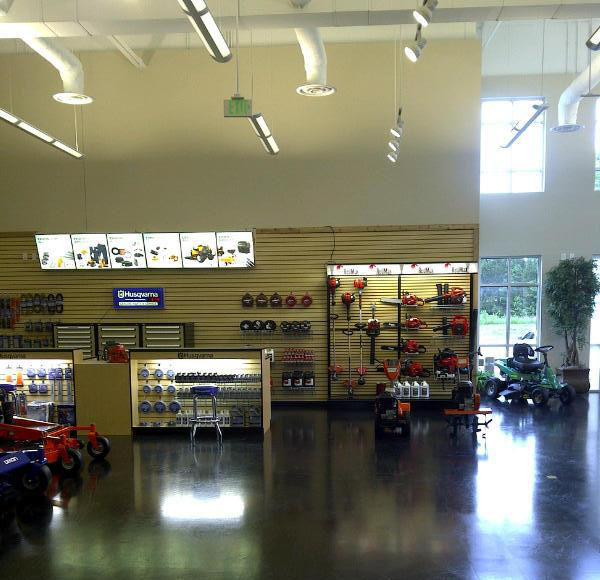 This new Charlotte R&D facility enables the landscaping arm to be a competitive leader in the green industry, with noise-suppressing back-pack blowers, a line of battery powered hand tools, and a battery powered riding mower among the list of their newest products. Acoustiblok’s quality noise abatement products, available internationally since 1995, have earned the industry’s highest ratings from architects, builders, and consumers. Independent laboratory tests show that just one, 1/8- inch layer of Acoustiblok in a standard wall resulted in more sound reduction than 12-inches of poured concrete. Environmentally friendly, Acoustiblok contains no lead, asbestos, or barium, is UV resistant and impervious to water and mold. Acoustiblok is UL classified, recognized, and sold in more than 50 countries. For more information about Acoustiblok products, call (813) 980-1400 or e-mail sales@acoustiblok.com.